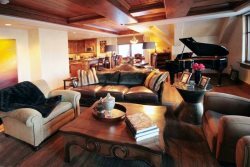 Located next to the slopes of Steamboat Mountain Resort, is one of the most affordable properties in the valley. Ski Inn condos is located under the Steamboat Gondola making it convenient access to skiing and comfortable accommodations. This 1-bedroom/1-bath condo features a queen in the master with an optional sleeper sofa in the living room. The kitchen features high-end quality appliances and the living provides a comfortable, high-quality feeling without the high dollar price tag.